Few rights that are guaranteed by constitutions and bills of rights are expressed to be absolute. In many jurisdictions, the legislature is permitted to impose restrictions on rights for specified reasons and under particular conditions. However, constitutional or bill of rights text often do not expressly indicate how the courts should determine that applicants’ rights have been legitimately restricted. To this end, courts in jurisdictions such as Canada and the United Kingdom have adopted the European doctrine of proportionality. Essentially, this requires them to balance opposing types of public interests – the interest sought to be protected by the rights in question, and other public interests such as national security, the protection of people’s reputation, public order, and so on. A proportionality analysis also requires courts to consider whether limitations on rights imposed by executive or legislative action have a rational relationship with the object of the action, and, if so, whether the limitations restrict rights as little as possible. On the other hand, when interpreting the fundamental liberties in the Singapore Constitution, courts presently do not engage in a proportionality analysis. 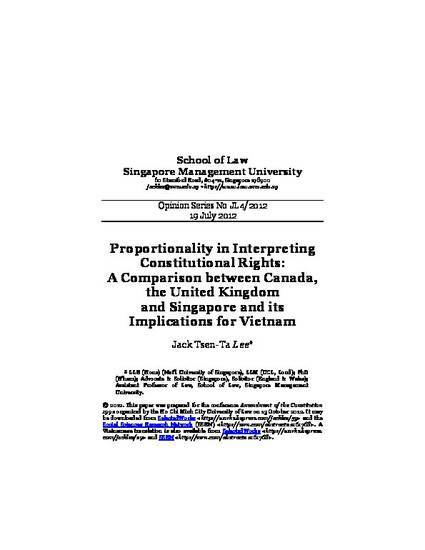 This paper considers how the rejection of proportionality has affected the rights to freedom of speech and assembly, and argues that the application of proportionality in Singapore is not only desirable but necessary if the Constitution is to be regarded as guaranteeing fundamental liberties instead of merely setting out privileges that may be abridged at will by the Government. It is hoped there are lessons in Singapore’s experience that Vietnam can learn from. A Vietnamese translation of the paper is available from Selected Works (http://works.bepress.com/jacklee/29) and the Social Sciences Research Network (http://ssrn.com/abstract=2161768).